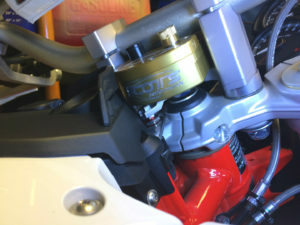 Scotts steering damper for BMW F800GS one of the essential mods to take your bike off road. 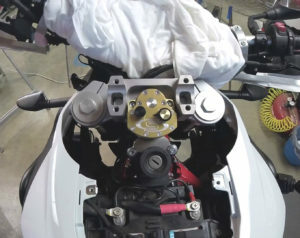 When it comes to steering dampers, Scotts steering damper is nothing but top of the line, they make handlebars stabilizers for most if not all the motorcycles on the market, obviously that includes the BMW F800GS. 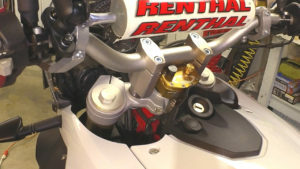 Scotts product is a compact, fully adjustable hydraulic shock absorbing damper that mounts right under the F8ooGS handlebars and it helps control the unwanted wobble (tank slap) of the front wheel. The advantages of a stable front wheel are, a more precise steering, less fatigue due to arm-pump and an easier to control bike on rough terrain or sand. While the bike’s own suspensions take care of the vertical movements the Scotts damper helps control the unwanted lateral movement. This is not just for off-roading, the benefit of having a stabilizer while riding on the asphalt include, a more stable bike under hard breaking and the reduce chance to incur into the infamous “tank slap” at high speed. The design of this damper makes it a breeze to transfer between bikes, equip all your bikes with the proper bracket and you can move the damper itself around with minimal effort eliminating the need to own multiple dampers for multiple bikes. – 3 fully adjustable circuits. – 25 clicks of adjustability of the dumping. – allows to adjust the amount of damping degrees you want from the centerline. – has adjustable high speed valve to absorb sharp edged jolts. – the F800GS kit raises the bars 20 mm and moves them forward by 3mm for increased comfort and clearance. 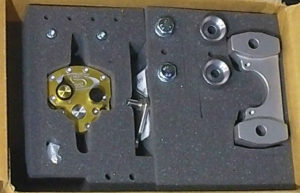 – the off-road version has no rebound damping to allow for quick corrections during the slides. – the sub-mount is made out of one piece anodized aluminum to resist the elements and the bracket is made out of stainless steel for strength. Install the new sub-mount. 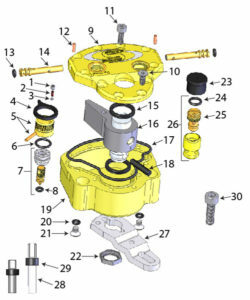 Pass the long bolts through the sub-mount, through the new bushing, through the stock rubber bushing, the cupped washers, the flat washer and the supplied nut. Tighten the nuts evenly, the rubber mount needs to flex slightly. Remove the bolts on the key switch, install the steel bracket with the stock hardware and leave it hand tight for now. Install the stabilizer, the tower pin needs to be centered into the link arm, you can adjust the height of the tower pin, but if you do, use Loctite on the jam nut and check for tension occasionally. Now tighten the key switch bolts, re-install the handlebars and tight the nuts evenly. Check the clearance by rotating the bars left to right full lock and verify freedom of movement, then start the bike and do it again before riding. Now trim the plastic key-cowling and you are done. It’s very important to periodically check the tension of the jam nut, it might have the tendency of shaking itself loose. At first set the dumper at the softest setting and work your way up from there. Give the dumper the same attention you give your bike’s suspensions, after many hours of usage it might need some TLC, at this point you can take it off and ship it to Scotts, who will give it a 10 point inspection and send it back to you. 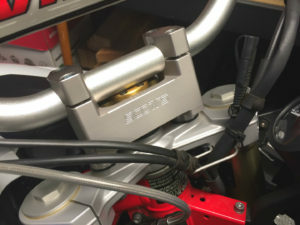 The BMW F800GS kit is not designed to be used with bar risers, they could be mounted to the sub-mount as long as the bolt as enough tread to hold tightly and the cables do not become too tight at all look.